“S” is for Spain apparently. So how about Carrilladas? Yes we are out of sequence as theoretically it should be “K” next. 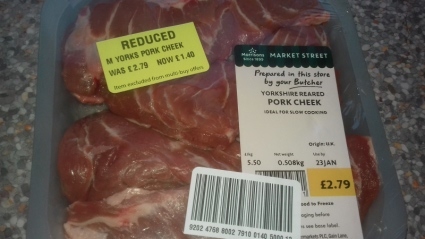 But Pork Cheeks for £1.40? Can't really pass that up can we? (1) Heat 1 - 2 tbsp Olive Oil in a large pan then add the onion. (2) Cook gently for 10 – 15 minutes until softened and lighty coloured. Remove and set aside. (3) Toss the cheeks in the seasoned flour. Add a little more oil to the pan and turn up the heat. (4) Brown the Pork cheeks all over in batches, setting them aside when browned. Turn the heat down to medium. (5) Return all the Pork and the onions to the pan. Add the Garlic, Cumin, Paprika, Cinnamon and cook for a minute. (6) Pour in the wine. Deglaze the bottom on the pan. (7) Pour in the Beef Stock then bring the pan to a simmer. (8) Simmer gently for 2 hours or until the cheeks are tender. We're thinking about serving on a bed of mashed Potatoes with veg. We shall see!